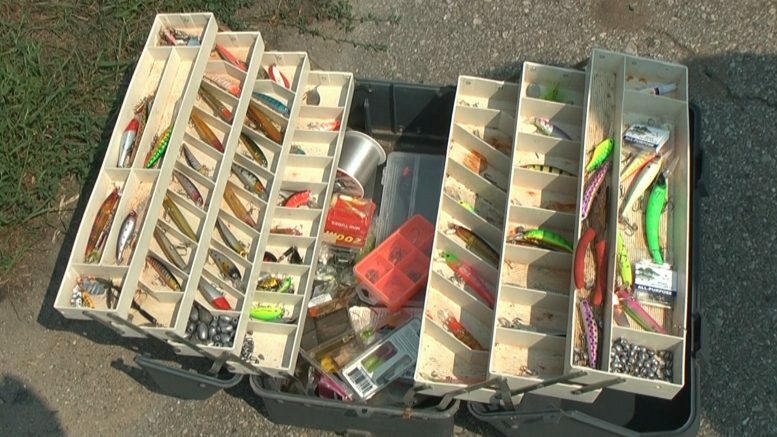 A fishing tackle box double the size of this one with more expensive lures and gear was stolen on Friday night from LaMarre Park. Alpena — A fishing tackle box valued at over $3,000 was stolen from a car on Friday evening at LaMarre Park but this wasn’t just any old tackle box. If you’ve been to the Brown Trout Festival, you’ve probably seen the ‘Fish Doctor,’ hoisting up the day’s catch at weigh in. His name is Roger Barc, an avid fisherman known by many throughout the community. He’s been fishing before he could walk. You’ll see a couple of his lines out at LaMarre Park, usually with friends. Roger and his nephew Ernest Butterfield hit the edge of the water on Friday evening around 5:00pm with some folks. The group fished until about 8:45pm. Roger left his 50lb tackle box in his green Jeep, parked about 20ft or so away from where they were fishing. A ramp obstructs the view to the parking area. After searching, the conclusion became evident, the tackle box was stolen. Barc left his Jeep unlocked like many do in that area when casting out. It was a shock to the party because Barc and his love for fishing are well-known along the Thunder Bay River. “The idea of it, I mean you’re sitting right here and somebody just comes and steals it out of your car, I mean come on,” said Nephew Ernest Butterfield.